We had the option set to compile radius into ipsec-tools, but it looks like it wasn't being properly used in the port. I'm trying to add it in now and hitting a couple issues. It should hopefully be in the next build. This is not implemented yet? I am looking for this solution also. It should be working now, but I'm not sure if anyone has tried it. Is that correct or should i upgrade? Did you define a RADIUS server under System > User Manager on the Servers tab? 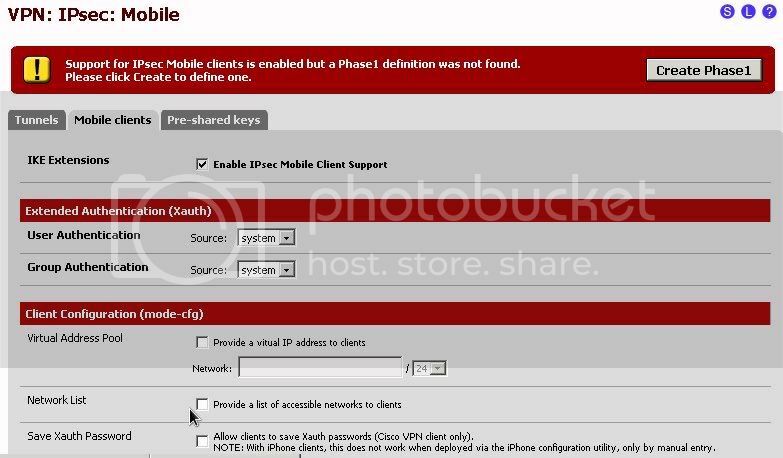 I just noticed the same thing that El Snorro is seeing when I attempted to make a Mobile Client IPSec VPN. My Radius server is configured properly, but I cannot select it from the list. Any idea when ( I know, I know… ) in what build we might see this fixed? Looks like it may have to wait for 2.1.